May 1st, 2015 – Venice Bull Reds! Lots and lots of reds! 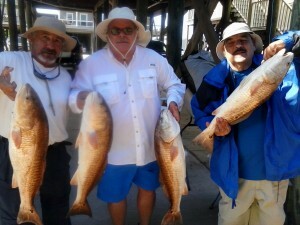 This Friday and Saturday 3 guys fished inshore with Home Run Charters: Arthero, George, and George from Puerto Rico! I only fished with them Saturday, but the day before they caught five trout, a flounder and 14 legal redfish and they through back over a hundred small red. On Saturday they wanted to chase after some bigger redfish. At first I tried some spots that had been really good the last few windy days, but all we could hook was a couple of sharks and one trout. We worked hard till 10:30am and the fish were just not there! So we packed up and made a 40 minute run on a hunch I had. On the way out the Puerto Ricans started talking together in Spanish, little did they know I understood. They thought I was bringing them out to the middle of nowhere. We made a couple of cast and caught nothing, I was afraid my hunch was wrong and we wasted the drive to this spot. 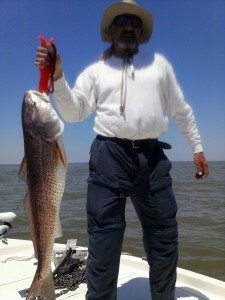 Then, all of a sudden, Arthero hooked up on a 25lb class redfish! After that all the reels started screaming. We landed the four bull reds we could keep and i asked if they wanted to go back and catch some smaller reds and they unanimously said “NO WAY”. They wanted to sit there and catch and release these bulls! We boated and released seven more bulls and broke 3 others off. They had a blast! It was one great day of fishing!!! The summer is here and the fishing is getting HOT! We still have some dates available for inshore and offshore this summer. But book soon because availability is going fast! Call (504) 909-TUNA to book now! 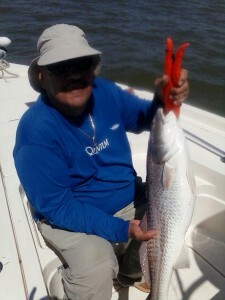 PreviousPrevious post:Fun Spring CocktailsNextNext post:April 23, 2015 – Venice Inshore Fishing! Is it Better to Fish Before or After the Rain? Thankyou for a fantastic vacation!!! We really had a wonderful time. Mrs. Eva’s meals were more than expected. Thank you!! We plan on returning! This was our first time fishing with Home Run Charters & Lodges. A spoiling experience where an offshore and inshore boat are ten steps from the backyard. Capt. Brian & John are a great offshore and inshore combo to have. We had so much to bring back we had to buy a new cooler on the way home!! John & Zach’s professionalism was unparalleled. Couldn’t have asked for better guides! Eva is a real prize. She went above and beyond to make sure our stay was exceptional! Top notch operation with superb guides, excellent accommodations and food! This was our 4th trip with Home Run Charters. The staff here keep us coming back! Great Service!! Fantastic food!! Unbelievable fishing!! 5/12/2017: “5 start” means we got all we paid for plus lagniappe!